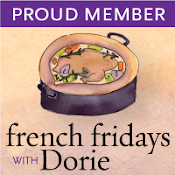 This week’s French Fridays with Dorie challenge is for classic Peach Melba. We indulged in the Bonne Idee and made Dorie’s Raspberry-Cassis Ice Cream as well. 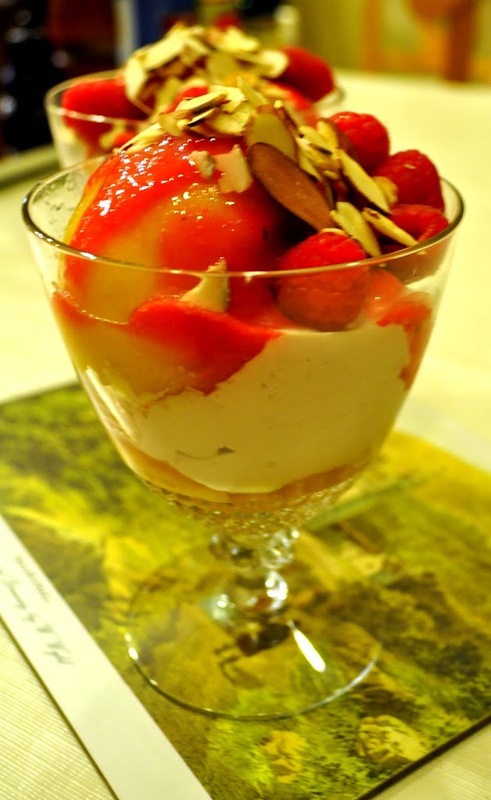 I love peaches, raspberries, and home-made ice cream, so I really wanted to love this dessert. Let me start by saying that the Raspberry-Cassis Ice Cream is incredible – creamy, flavorful, and custardy (yes, I just made that word up!). 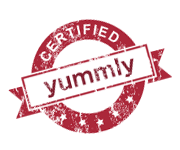 Maybe that was the problem – the ice cream was so good that everything else paled by comparison. Riesling (or Moscato) Poached Pears are one of our favorite desserts and we make them often. When we make the pears, we cut them in half and poach them for about 20 minutes. So, I wondered why the peaches were poached whole, then halved later. Next time, I will follow our method as the sauce was amazing. As it was, following the recipe, I think that fresh peaches would have been just as good. and far less work. Raspberry-Cassis Ice Cream in the making! So, the verdict? It’s like that new movie that all your friends rave about that you finally get to see and wonder what all the fuss was about. The Raspberry-Cassis Ice Cream totally steals the show. In the meantime, I cut the remaining two peaches up to soak in the sauce and I’m looking forward to more of that ice cream! What a heavenly dessert, I just love this! This does look lovely & I am sure the cassis ice cream was a winner! I also found my peaches a little difficult to cut in two (the damn pits gave me fits also) and I didn’t get beautiful-looking halves (which I covered up, of course). 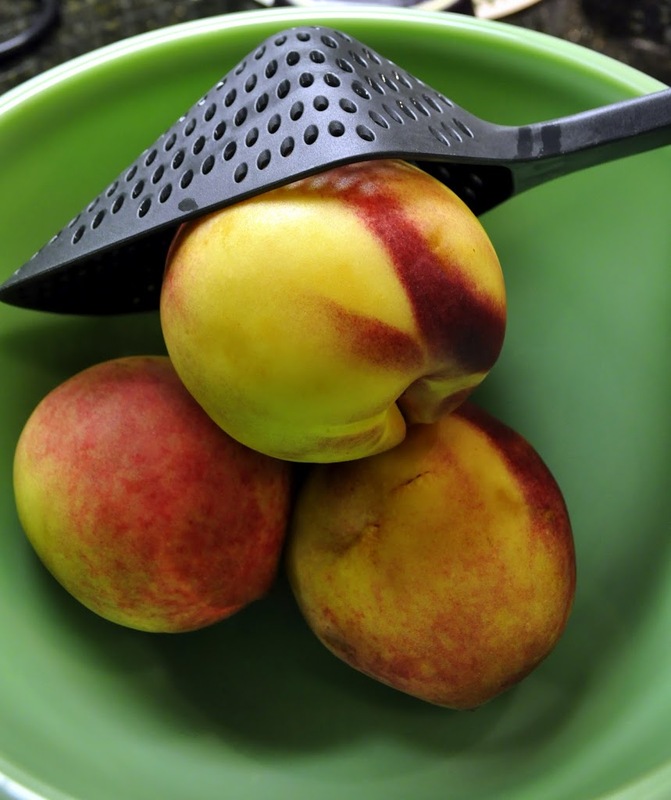 I really enjoyed this dessert and want to capitalize on the fabulous peaches I’m getting from Palisade so I will use your tip and halve the peaches and let them get drunk in the sauce overnight. I think homemade ice cream, especially the flavors you two put together, will always outshine anything else on the plate or in the bowl. I was short on time when I made this but I brought my ice cream maker with me to Colorado so will definitely make Dorie’s Bonne Idée the next go-around. On the other hand, since I’m an only child now, why don’t I just come live with you two and enjoy the bounty of your table! 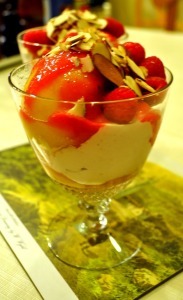 I’m impressed that you made the ice cream to go with this….looks and sounds wonderfully luscious!! I cut my peaches in half to poach them…that’s the way I always poach fruit. Glad I didn’t follow the recipe for that! Happy 100th, Susan! It has been a pleasure, my friend!! Looking forward to the next 200+…. You may be right at this time of year fresh peaches have so much flavor I like that you had the ice cream take on the liquor. Beautiful. I guess I lucked out by not reading the recipes because I halved mine prior to poaching. I am totally jealous of the ice cream, it sounds fabulous. I did really like the syrup bad am looking forward to using it in other things. Your “typical” poached pears sound great too! When peaches are in season they should not be disturbed. The final dessert looks wonderful! I made the ice cream too, having no peaches around, and paired it with chocolate cookies. Fantastic ice cream, I agree with you. Could even use a bit more of raspberries and cassis also. Have a great weekend Susan! The ice cream really does sound wonderful. We enjoyed this dish, but then we had store-bought ice cream. I think halving the peaches first might be in order next time ’round. 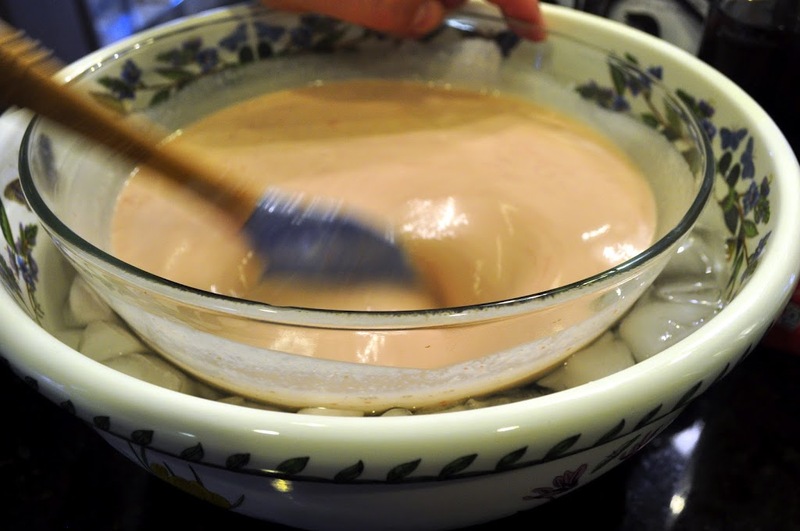 It would be nice to get some more of the flavour of that lovely poaching liquid into the peaches. The ice cream really was amazingly good. I almost liked the ice cream better on its own than mixed into the sundae. But I also really liked the sundae and LOVED the poaching syrup. In fact, I am enjoying the leftovers in a glass of sparkling wine, very tasty. That said, I am interested in your riesling poached pears and I like the idea of cutting them in half first. We live in riesling country after all. OMG – I NEED to make this icecream asap. Looks amazing! 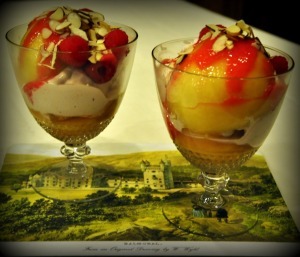 yes, we agreed here that we would rather halve and pit the peaches before poaching… it wouldnt change much except that it would be easier to eat… 🙂 your ice cream looks great though! Your ice cream looks fabulous. I used Ben & Jerry’s so the star of my melba was the peaches. I loved them. I think I’ll try your technique next time though. The peaches tasted better, the longer they stayed in the syrup. I just finished the last peach and there is a lot of syrup left so I’m going to poach another batch. Happy 100th recipe, Susan. I’ve enjoyed cooking with you getting to know you.